Thimphu is a unique capital with a blend of the modern and the ancient culture. The bustling modern town is surrounded by ancient temples and the Tashichhodzong, the seat of the government and the monastic order. 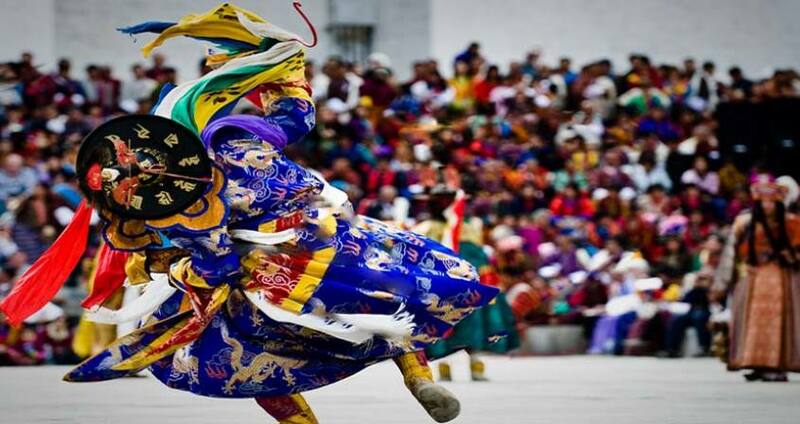 The Thimphu Tshechu reenacts the teachings of Guru Rinpoche, the 8th century spiritual master, through mask dances and is attended by thousands of local people. Inclusion : Government royalty, all meals, tea and snacks, accommodations, transport, permits, entrance fees, guide services and sightseeing. Exclusions : Drukair fares, visa fee (US $40), phone/internet bills, insurance, drinks and beverages, tips and other personal bills. Day 1Paro-Thimphu The flight into Bhutan takes you to the great Himalayas, offering the most beautiful scenery of the world's highest glacial peaks. On arrival at Paro Airport, you will be received by representative of Pink Mountain Treks and Expedition. After lunch, you will drive to Thimphu, the capital city of Bhutan. In the evening relax at the hotel or stroll through Thimphu town. Overnight hotel in Thimphu. Day 2Thimphu Festival After early breakfast attend full day Thimphu Festival, which is held outside the courtyard of Tashichhodzong. The Tshechu is a festival in honour of Guru Rimpoche, the saint who brought Buddhism to Bhutan and the Himalayan world. Overnight hotel in Thimphu. Day 3Thimphu-Punakha After breakfast, you will catch a busy Weekend Market at the bank of Thimphu River where people from nearby villages come here to sell their farm products. You can stroll through the market to see the variety of food of the country, including basket upon basket of fiery chilies, fresh cheese, and mangoes. In addition, many stalls contain Bhutanese handicrafts and household items. It's fun to wander the aisle, taking in the bustling atmosphere of the market. Perhaps this market scene offers wonderful opportunity for photographs and to mingle with local people. After lunch, enjoy the scenic drive to Punakha with a stop for tea at Dochu La (3,100 meters), where on a clear day you can get spectacular views of the Himalayas. From the pass, drive downhill through the forests of rhododendron, fir and hemlock. You will arrive at Punakha after traversing through rice field and along the bank of Punakha River. Visit the Punakha Dzong, which is stunningly situated in between the male and female rivers like an anchored ship. Overnight hotel in Punakha. Day 4Punakha-Bumthang After breakfast you will drive to Bumthang, the cultural heartland of the country. The route is along a spectacular winding road, crossing 3,300-meter-high Pele La pass, and at certain times of year it's possible to see yaks. You will stop in Trongsa for lunch. After lunch you'll visit Trongsa Dzong, the masterpiece of Bhutanese architecture. Then you'll proceed to Bumthang with lush valleys and hilly forests. Along the way you will stop at a yathra (textile weaving) factory, where the yathras are designed with patterns unique to Bumthang, and you can even watch some of the weavers at their looms. Check into hotel on arrival. Overnight hotel in Bumthang. Day 5Bumthang Today’s sightseeing in Bumthang includes Jakar Dzong, the administrative center of the valley; Jambey Lhakhang, one of the oldest monasteries in Bhutan, dating from the introduction of Buddhism in Bhutan; and Kurjey Lhakhang, one of the most sacred places, because Guru Rinpoche left his body imprint on the cave when he was meditating. After lunch, you will also have a chance to tour Tamshing Lhakhang, a treasure house of interesting religious Buddhist paintings. In the evening you can visit local shops. Overnight hotel in Bumthang. Day 6Bumthang-Wangdue You'll begin the day at the Bumthang market, and then drive to Wangdue. Stop at Chendebji Chorten for your lunch. Chendebji Chorten was built in 18th century by a lama named Shida in a Nepalese style with eyes painted at four cardinal points. After long exhilarating drive passing through two spectacular high passes, you will arrive Wangdue. The nearby villages of Wangdue are known for their slate and stone carvings. Overnight hotel in Wangdue. Day 7Wangdue-Thimphu This morning you will return to Thimphu. On the way, you will stop at Metshina Village and take a 20-minute walk through the rice fields to Chimi Lhakhang, which is a fertility temple dedicated to the Devine Madman or Lama Drukpa Kuenley. If you wish, receive the blessing from the Lama’s wooden phallus! On reaching at Dochula, visit the new Druk Wangyal Monastery, which is the only of its kind in the country with elaborate paintings depicting the lineage of the present monarchy and their visionary works. After lunch at Dochula, you will continue drive to Thimphu. Overnight hotel in Thimphu. Day 8Thimphu After breakfast you will visit the King's Memorial Chorten (built in memory of the third King of Bhutan who reigned from 1952-1972). Next visit the radio tower (for a great view of Thimphu Valley and the Thimphu Dzong), and the zoo, which contains the national animal of Bhutan: the takin. From there you will visit the nunnery temple, the National Library (which houses ancient manuscripts), and the School of Arts and Crafts (also known as the Institute for Zorig Chusum). After a relaxing lunch, you will visit the National Institute of Traditional Medicine, a traditional paper factory and the majestic Tashichhodzong. Overnight hotel in Thimphu. Day 9Thimphu-Paro After breakfast, you will drive back to Paro. You will visit the Ta Dzong, once a fortified lookout tower that is now the National Museum. The museum has wide assortment of ancient paintings, armors, philatelic display and “field of Buddhas”, which helps one to visualize while meditating. Then walk down the trail to visit the Rinpung Dzong meaning “fortress of the heap of jewels". After lunch, visit Kichu Lhakhang, the oldest temple in the country. From there you will be taken to the Drugyal Dzong (Bhutan Victory Fort), which was built in 1646 to commemorate Bhutan's victory over Tibetan invaders during the 1600s. 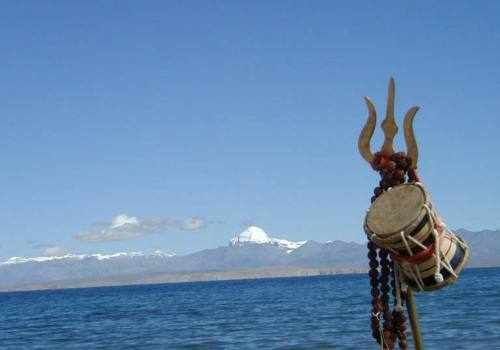 On a clear day you can see Mount Jumolhari, Bhutan's second-highest mountain at 7,314meters. Overnight hotel in Paro. Day 10Hike to Tiger's Nest MonasteryAfter breakfast hike to Taktsang (Tiger's Nest) Monastery, which is Bhutan's most famous monastery situated at 3180 meters. Guru Rinpoche (8th century spiritual master) is said to have flown on the back of a tigress to meditate in a cave where Taktsang Monastery now stands. Lunch will be served in the Cafeteria Restaurant, located about halfway up on the mountain. The monastery is perched on the edge of a steep cliff, about 900 meters above Paro Valley. After having explored the monastery, you will hike down to Paro. In the evening, you can visit a traditional farmhouse and, if you wish, enjoy "ara" a local wine produced by a brewery of wheat or rice. Overnight hotel in Paro. Day 11Depart Paro After breakfast, drive to the airport for departure. Pink Mountain Treks and Expedition's representative will bid you farewell.